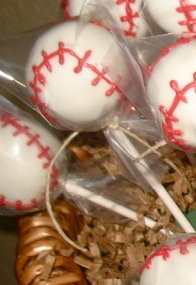 So, ever since I found out that I would be in charge of my son's Little League baseball team snacks after the game on his birthday, I just knew that I had to make baseball cake pops. So cute, so simple, so perfect, right? It seemed simple enough: make cake balls. Skewer with stick. Dip in white chocolate. Prop up to let cool. Pipe on red stitching. Something strange happened when I was melting the chocolate- I think there's something off with the temp setting on the burner I was using- and it just started clumping (btw, there was no water in it- I know that's the usual culprit of melting mishaps, but I was very careful). When I skewered the cake balls and tried to dip them, they started falling off the sticks (yes, I had chilled them ahead of time- didn't seem to help). My "propping-up" technique was a disaster, and the pops kept falling over and running into each other and, again, falling off the sticks (I know, I should have used a block of styrofoam like recommended). Long story short(er): It was an epic fail. My baseball cake pops turned into strange, flat-topped, impaled snowballs. I wanted to either cry or throw my hideous little snowblobs at something. I was dreading telling my son that, alas, there would be no baseball cake pops after all. Chips and Capri Suns would have to do for the post-birthday-game snack. But then, in all my melted misery, I grabbed one of the stupid things and put it in my mouth. And man, was it good. It may have been the ugliest treat ever made, but it was downright delicious. My heart lifted just a little. I decided that I didn't care if they were homely. They were awesome! So what if they weren't going to be my perfect little baseball pops? Maybe nobody would have to know they were supposed to be baseballs. These were a bunch of 6- and 7-year-old boys. They eat dirt. They don't care if I'm Martha Stewart. Their mouths can't tell the difference between unsightly clumps of cake on a stick and red-piped cake pops. They just want to be fed. So I stuck them with sticks, dripped some clumpy chocolate on them, and turned them upside down on waxed paper in the freezer. I figured as long as they made it to the game and into little mouths, I'd call it good. And you know what? My son didn't care. He said, "Thanks, Mom!" and devoured one. I had to grab the stick away before he wolfed that down too. So what does this have to do with writing? Well, if we let our inner Martha Stewarts (or J.K. Rowlings or Stephenie Meyers or Suzanne Collins-es) dictate our writing, it will never be good enough and we'll end up with chips instead of cake pops. The delete button on our computers will start filing for overtime pay and our WIPs will get stuck in our mires of self-doubt. It's time to embrace the hideous, people! Your first draft will be ugly. It will be a misshapen snowball at the end of a stick. But it will still taste good. The point is to feed those hungry, craving mouths that want a good story, to make something delicious, even if it isn't pretty. There will be time to make it pretty later. Just get it out of your head and onto the page. A great and inspirational analogy! Re-motivated me to get back to work on my Pan Am Memories. I love this! It's so freeing when you realize that first draft can be ugly. Just GET IT WRITTEN and then you have something to make beautiful! I really like your analogy (I had to giggle when you said it's time to embrace the hideous), and the admonition to "just get it out of your head and onto the page." Wise words that inspire me to do just that!! Thanks Kasey. This is definitely a reminder meant for me.